Broadcasting from our community in Florence, Italy, Radio Krishna Centrale reaches more than fifteen million people. The most popular program, Radio Cucino (cooking lessons), is hosted by Krishna Caitanya dasa, who sometimes recites the prayers for his listeners' offerings during the show. Listeners often telephone the station to express their thanks for this recipe. Wash the spinach thoroughly, remove the larger stalks, then wilt the leaves by plunging them into boiling water for a few minutes. Let them drain well, and then press out any remaining water. Chop the leaves into small pieces on a cutting board. Use a medium-sized saucepan to heat the ghee or vegetable oil and fry the ginger and the chilies, followed by the ground spices. Add the chopped paneer and stir fry for 1 minute. Then add the spinach. Toss in the salt and mix the ingredients well with a spoon. Transfer the mixture onto a smooth working surface, add the chickpea flour as a binder, and knead well. Now roll the mixture into 1 inch (2.5 centimeters) balls and deep fry them in ghee or vegetable oil until lightly browned. Then drain. 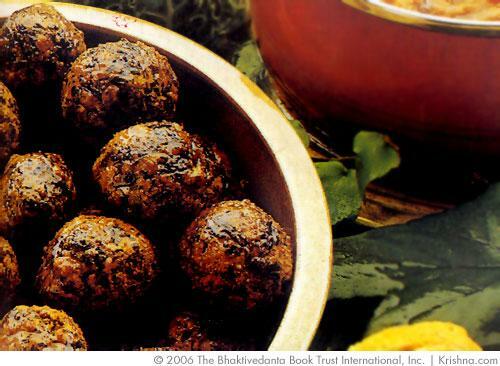 Palak koftas are tasty served with a tomato sauce or eaten as is. Submitted by Manish (not verified) on Fri, 04/22/2011 - 00:26.